In celebration of yesterday's great jump by Felix Baumgartner we are reposting this from 2007. Captain Kittinger (now 84) was up there with the Austrian daredevil. The only person FB talked to on his descent was the captain. 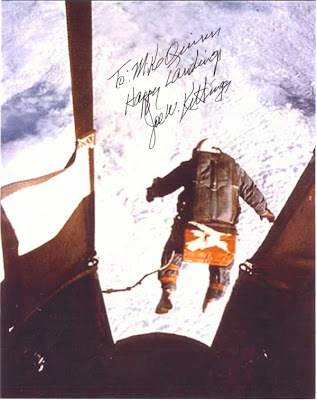 He broke all sorts of records but Kittinger was actually in free fall for 17 seconds longer! Highly uncommon regularly published book that is much sought after. Back in the 1950s and early 1960s, well before liquid-fuel rockets were fully operational, a small group of military men made the first exploratory trips into the upper stratosphere to the edge of outer space in tiny capsules suspended beneath plastic balloons. They are sometimes referred to as 'the pre-astronauts.' Doctors, physicists, meteorologists, engineers, astronomers, and test pilots, they made great personal sacrifices and took great risks in the promise of high adventure and the opportunity to uncover a few secrets of the universe. One of their number, Capt. Joseph Kittinger, rode a balloon up to 103,000 feet in an open gondola and then stepped out and freefell to Earth, becoming the only person to break the sound barrier without a vehicle. 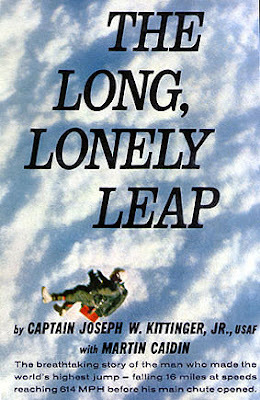 Kittinger wrote the book with Martin Caidin, aviation writer, pilot, and author of over two dozen books, the two men flew and spent months together to re-create the amazing events of this story. "These...jumps reached their climax in his famous record leap from the very edge of space itself, almost 20 miles above the earth. This drop included a free fall lasting more than an incredible 4 1/2 minutes, during which Captain Kittinger reached a falling speed of 614 miles per hour before his parachute finally opened at 18,000 feet. Captain Kittinger describes the preparations for the balloon ascent, and the actual ascent itself. He tells of floating for eleven minutes in the alien world of space, 102,800 feet up. Then . . . the descent. Using an actual tape recording of his words as he fell, Kittinger relates his impressions, vividly re-creating this magnificent and terrifying experience." VALUE? I hesitate to say 'sky high' but this a hard book to find. There are copies sans d/w at $1000+ on the web and well read copies at $500. Wikipedia, posited a reprint in November 2005 that didn't happen and says that 'surviving copies are 'expensive.' A National Geographic from December 1960 has an article about his jump and that can command $50. His signed photo can go for $300.